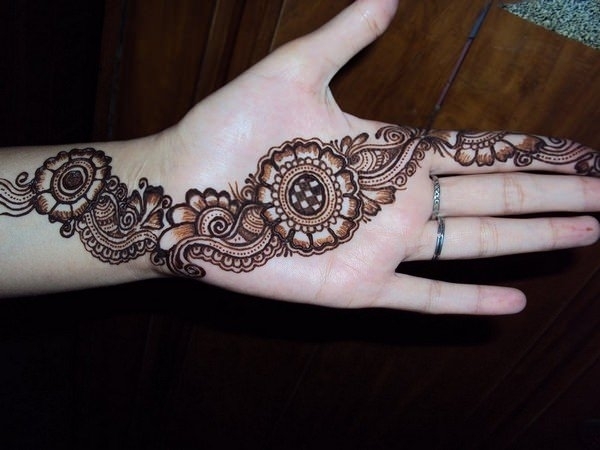 Another name for a henna tattoo is a Mehndi, and there is a special significance when it comes to Indian women. 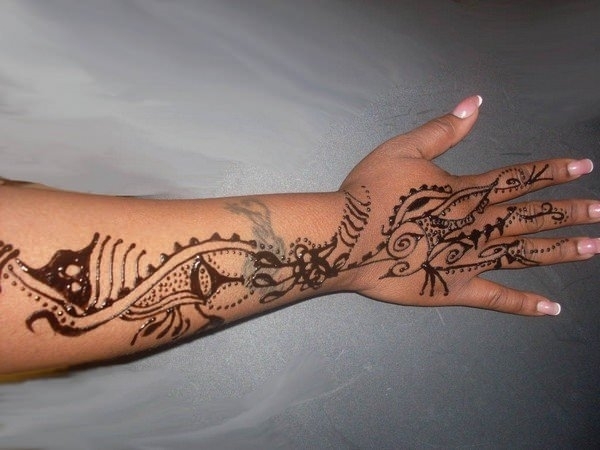 Many different cultures have used the henna tattoo but for Indian women, the henna tattoo is incorporated as a tattoo design in regards to celebrations. 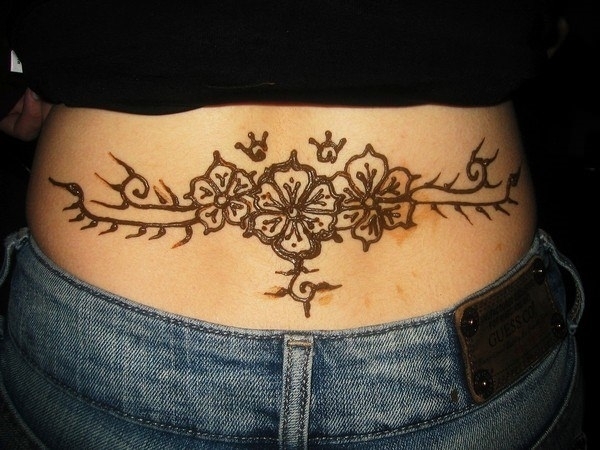 The henna tattoo is highly regarded by the Ayurvedic medicine because they believe it has the ability to eliminate impurities and infections as well as soothe the stomach. The henna product is made from the white blooms of the henna plant, a fragrant flower. It’s also often used as perfume. These tattoos can be created in many different sizes and shapes. 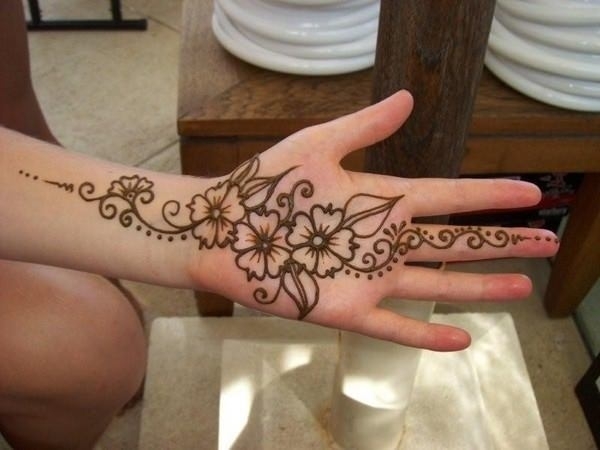 Many women, however, prefer the flower designs of the henna tattoo as they are more feminine and delicate looking. 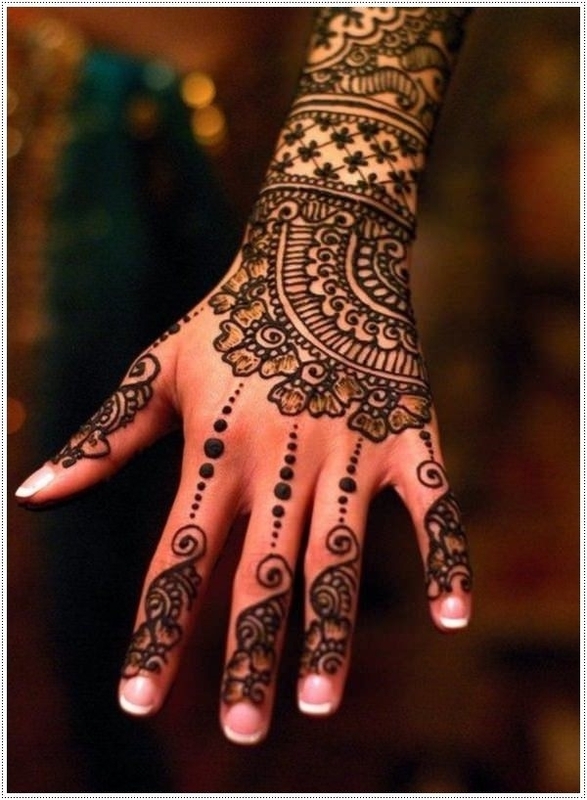 The henna tattoo is an original and beautiful design that many Indian women wear during their wedding ceremonies. It’s almost like an accessory in the same way that many women wear a bracelet. But it’s part of the celebration of marriage. 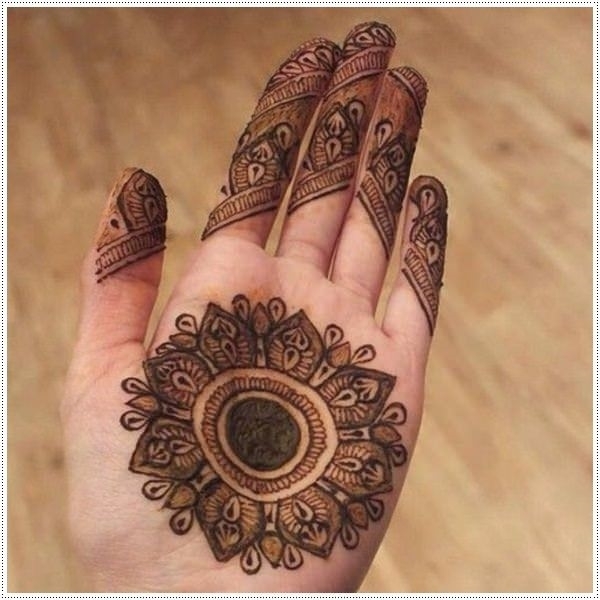 It’s important to find a skilled person to apply your henna tattoo as it takes a very steady hand in order to apply the henna tattoo correctly. 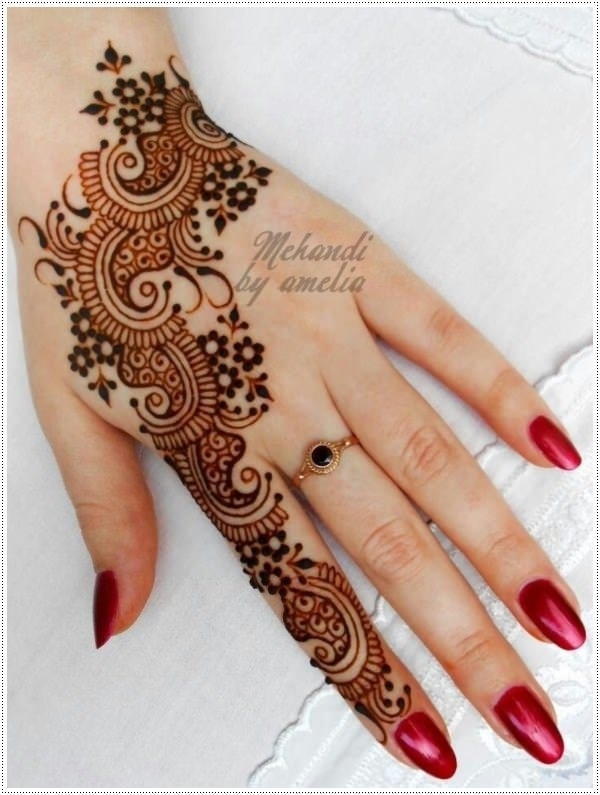 For many years the henna tattoo used to be applied with henna paste and a matchstick. The matchstick was used to ensure precision of the tattoo. In our modern times, however, henna is purchased in a cone form. From there you make a small opening in the point of the cone so that the delicate designs can be created on the skin. It’s much the same way as a cake is decorated. The point of the cone is used to ensure precision. 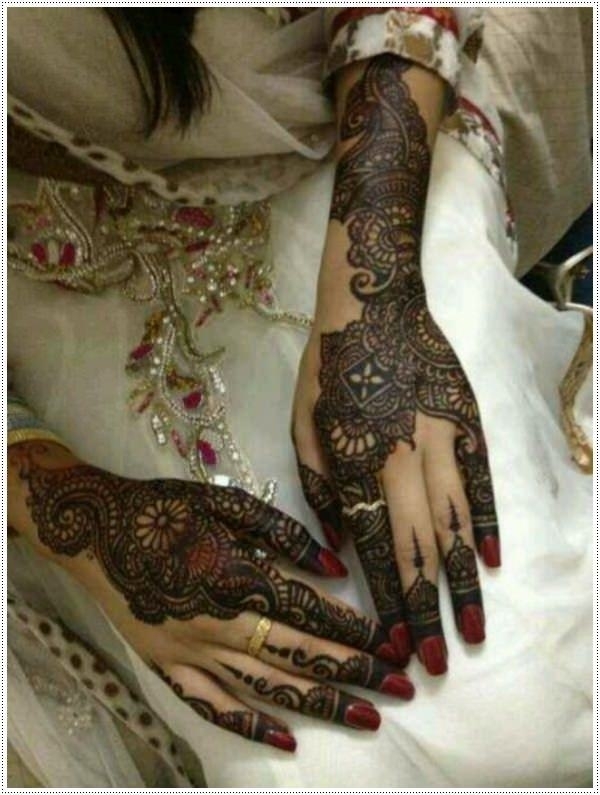 Weddings are a big time for Indian women to receive a henna tattoo. 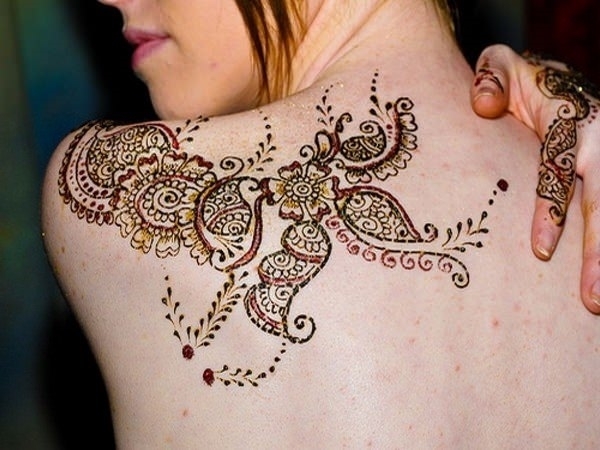 Many salons in India will offer the henna tattoo as part of their wedding packages. 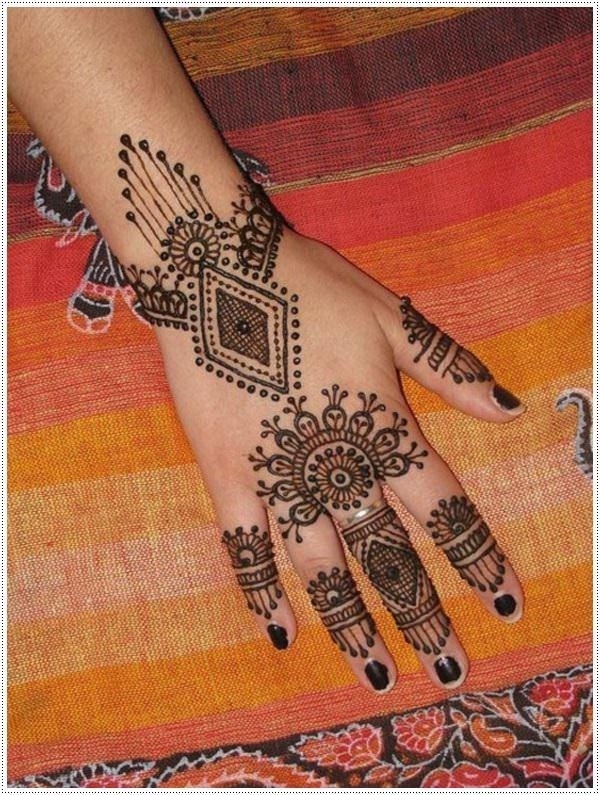 They are also given henna tattoo during Indian festivals such as Diwali. There is also the option of having it done for you in your home. 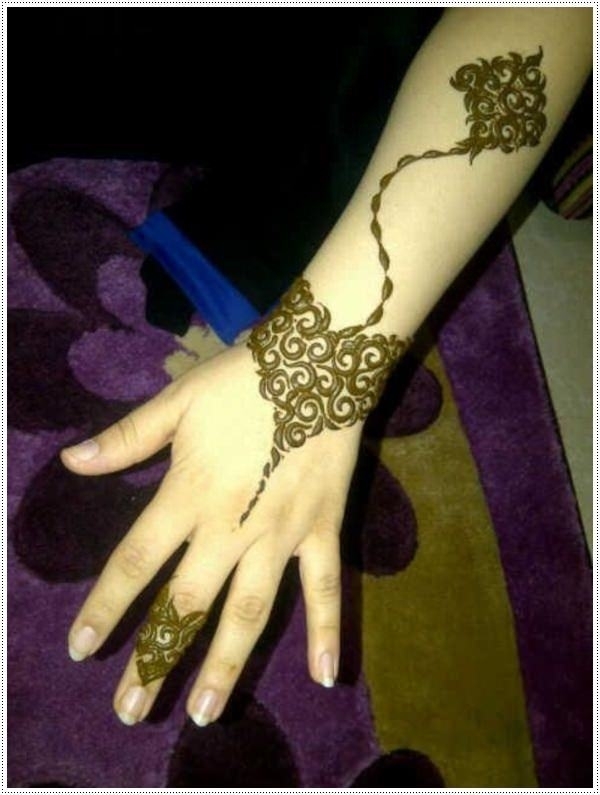 There are many young women and even girls who are skilled in applying the henna tattoo, and they will travel to your home to apply your chosen design. This can be helpful on your wedding day when you are strapped for time. 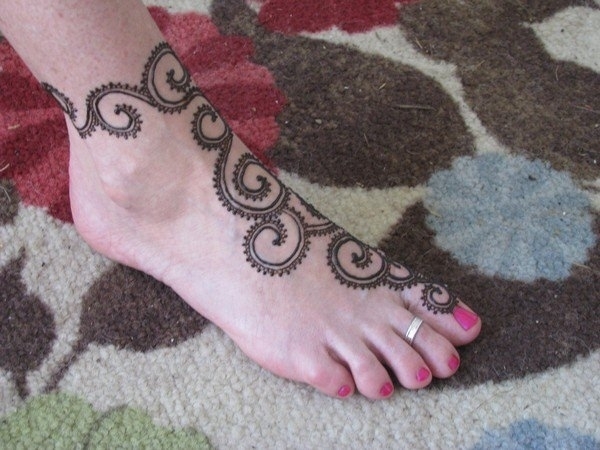 When it comes to getting a henna tattoo for your wedding, it is most often applied to the feet or hands. 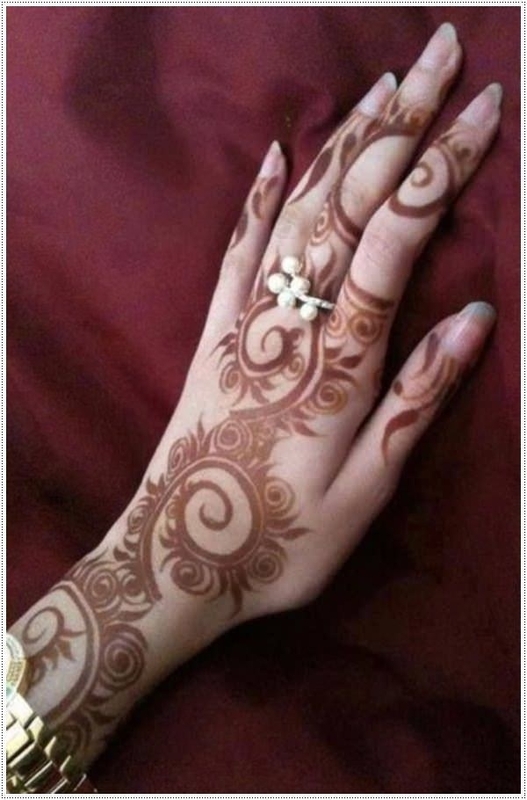 Indian women make a big deal about the application of the henna tattoo as it’s part of their tradition. Three days before the wedding, the bride will invite all her female friends to her home for what is called a mehndi ceremony. 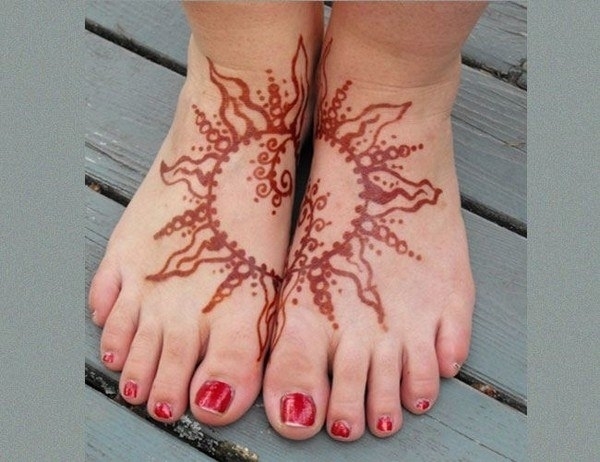 Everyone gets their feet and hands decorate with henna designs. The most detailed and intricate design is saved for the bride as it is her special day. 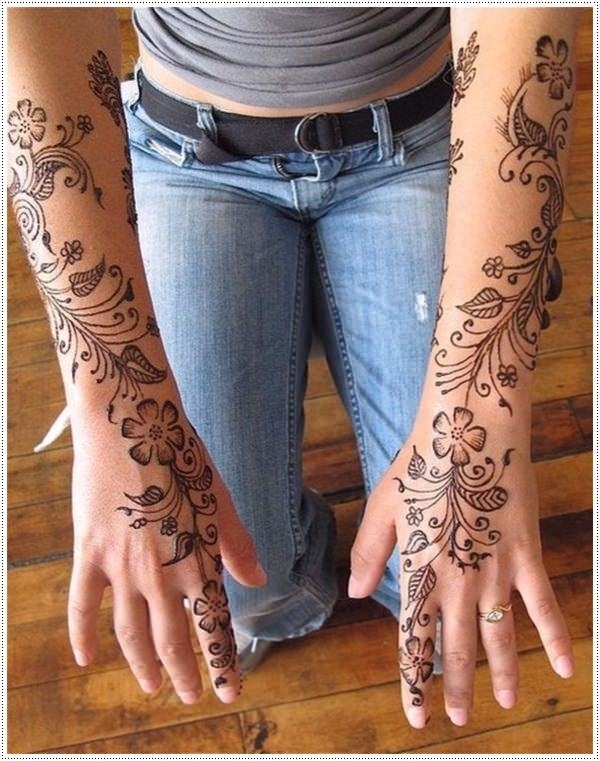 The design itself of the henna tattoo is often some form of floral design, which for Indian women is a sign of fertility. It’s a blessing towards the future marriage. Many Indian women upon getting married hope to start a family with their new husbands and hope for the blessing of healthy and happy children. The henna tattoo is a blessing for the husband and wife, for their future together. The bride does have the option of choosing from other designs or even having another design incorporated into the floral design as well. Another sign of fertility is the peacock; it’s also a symbol of good fortune and love. 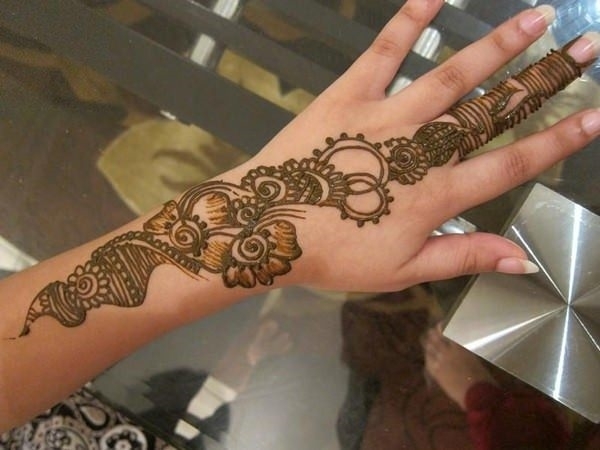 It’s also a popular henna design for the bride who wants something more than a floral design. 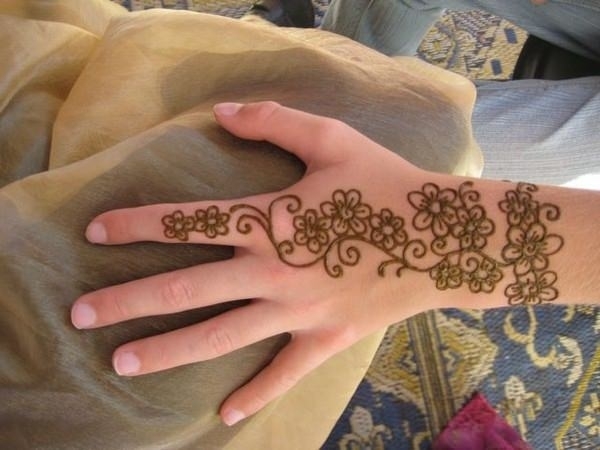 Floral buds are also popular for a henna tattoo as it is a symbol of a new life for the bride as well as a sign that her love will flourish and grow during her marriage to her husband. When the henna is applied to the bride’s skin, it’s marking her with good fortune for her role as a new wife. 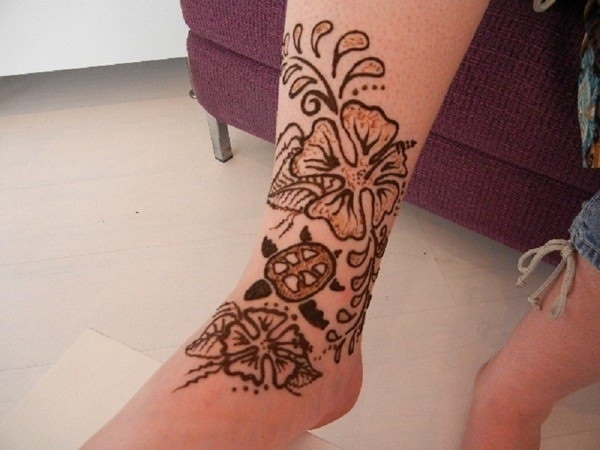 Once the henna is applied to the skin, she can then relax with her friends and family. At this point, everyone in the room will give the bride-to-be important advice about marriage and her role in it. They give advice before she takes that important step in her life. The whole purpose of the Mehndi ceremony is to collect together and bond with the bride. It’s a time of enjoyment and connection with one another. It’s similar to why the western world has a bachelorette party; it’s connecting with your friends and family before your big day. It’s not just the bride that gets attention in the henna style. The groom gets involved in the process as well. They have a tradition where the groom’s initials are applied somewhere among the rest of the henna tattoos that the bride has. It is the groom’s job to find those initials if he doesn’t then he must purchase a gift for the bride. 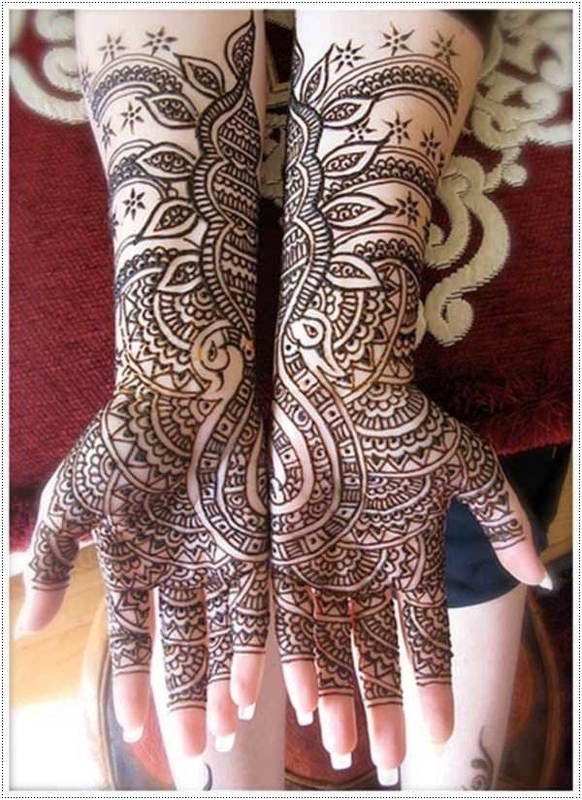 It’s also said to be an Indian legend that the darker the henna tattoo, the more the mother-in-law will love the bride. A weird tradition, but so are many bridal traditions. One great tradition is that the new bride is not expected to help with household chores until her henna tattoos have faded. For anyone that’s received a henna tattoo before, that process could take weeks. 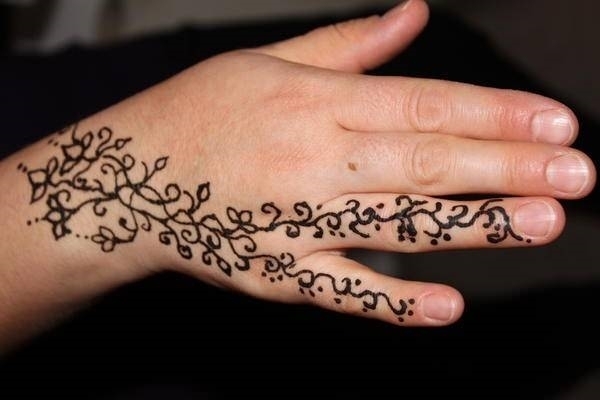 These are just a few of the reasons why the henna tattoo is significant, especially when it comes to the wedding tradition. It’s not just for Indian women. 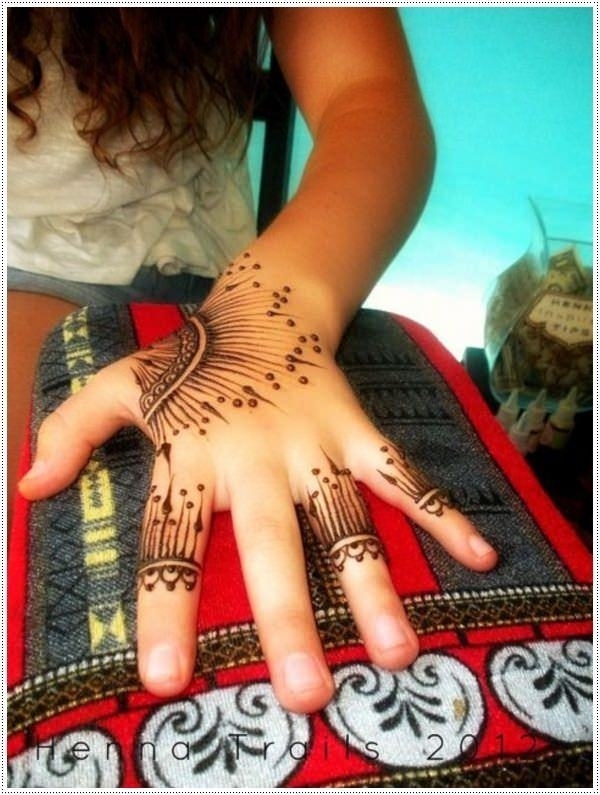 However, many different cultures can receive a henna tattoo just to appreciate the significance and beauty of one. The intricate designs are certainly beautiful. Many people have no idea what a henna tattoo is before they get one, and there are often a lot of questions associated with them. 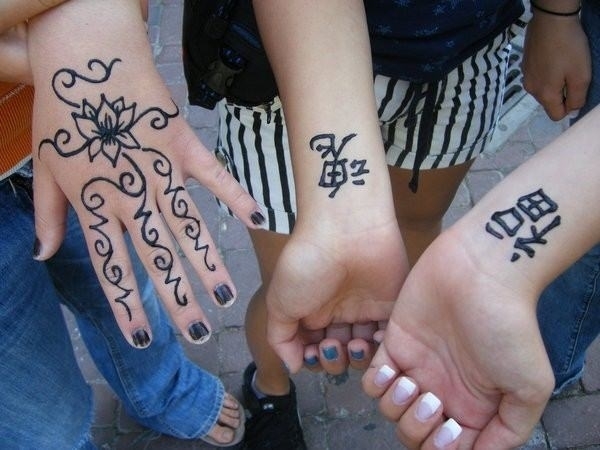 Henna tattoos are everywhere, much in the same way that regular tattoos are everywhere. It’s a popular body piece just like a regular tattoo, especially when it comes to the younger generation. 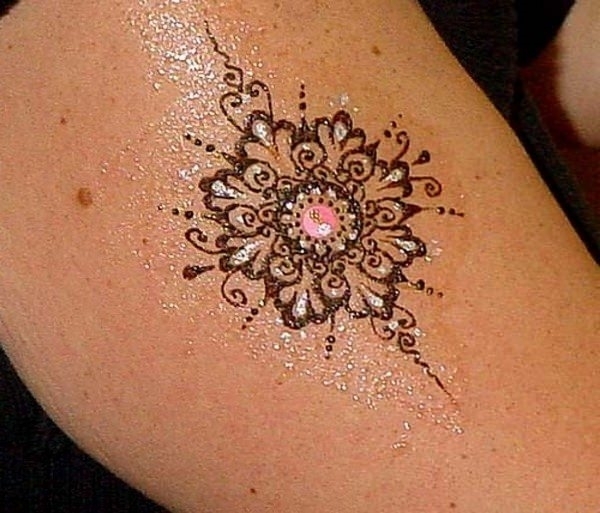 The popularity of the henna tattoo has not faded over the years; it just grows in popularity. 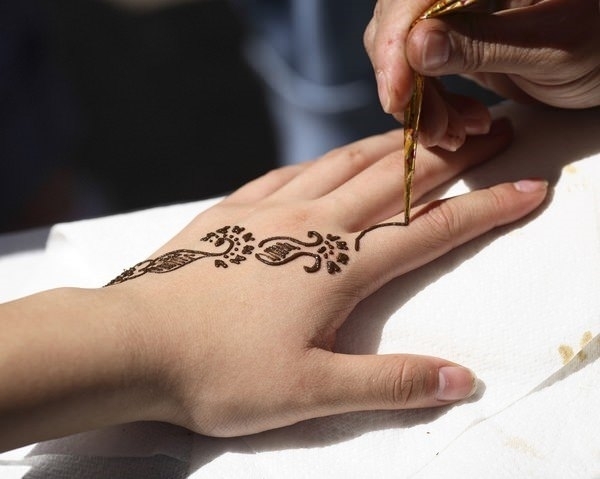 The reason for the popularity of the henna tattoo is due to the many different celebrities that will get a henna tattoo and then don it in public. It’s become a more accepted form of body art because of that. 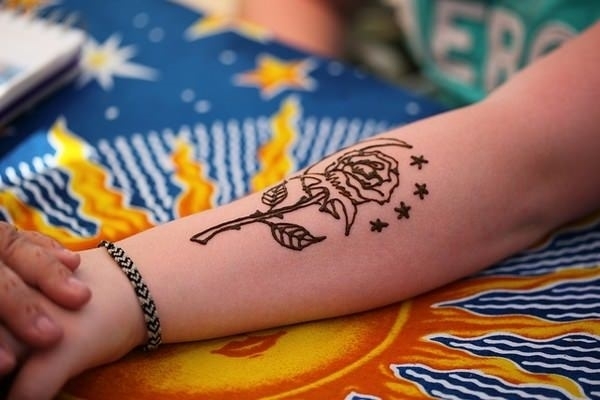 There are many artists, icons, and rock stars that have accepted henna tattoos and have made them even more popular today. Here are three different designs that give you some idea of what you can get. As you can see, they are all very intricate and lovely. 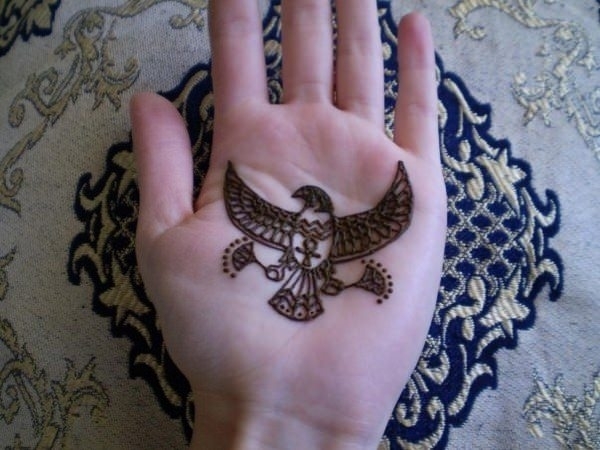 This henna tattoo is very similar to the 3D tattoos that you can get. Of course, this one is not permanent. It might be a great way to decide if you really want a permanent tattoo. 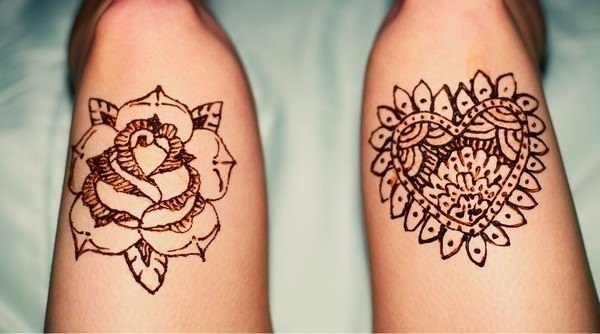 Here are an example of a henna floral designs as well as one with a heart. 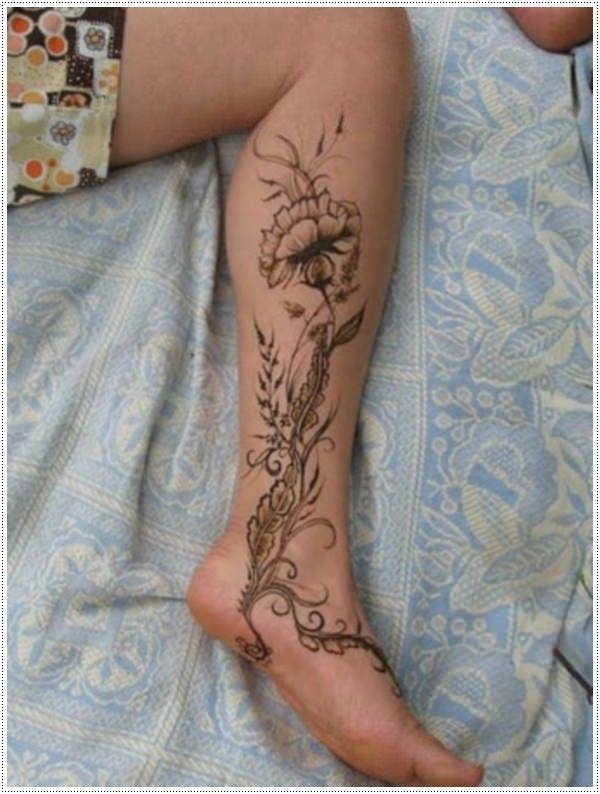 Henna floral tattoos are a sign of good fortune especially in regards to a marriage or a baby. 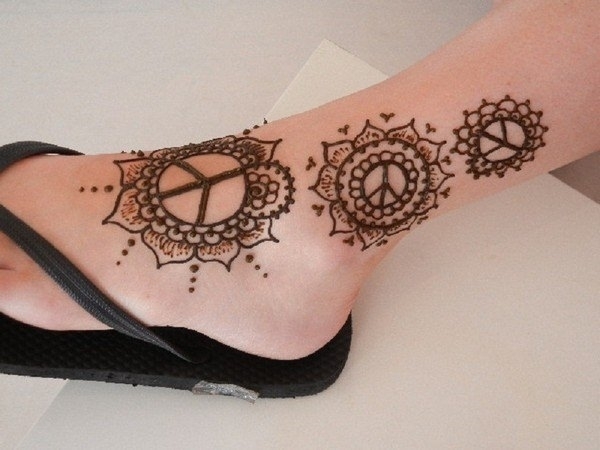 This is a great example of a different style of henna tattoo. It’s a large one that reaches up to the arm. Chinese symbols aren’t common as a henna tattoo, but you can get pretty much anything you want. 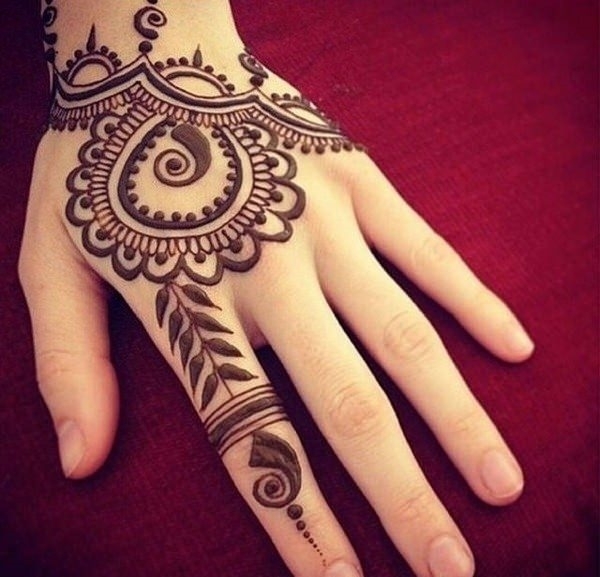 This henna tattoo looks like a bracelet, and the design is absolutely gorgeous. 8. This person has her arm and hands designed as a henna tattoo very much in the same way that tattoo sleeves are done. 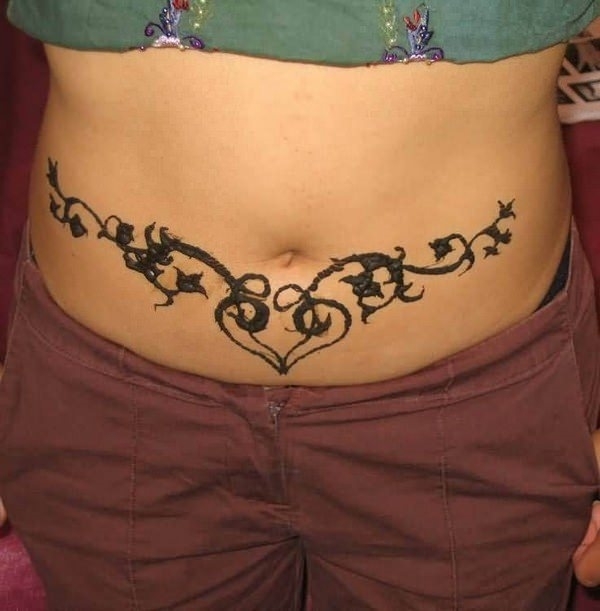 This henna tattoo is around the waist, and it’s in the shape of ivies. Eagles are always great symbols to have, and it looks very strong on the hand. 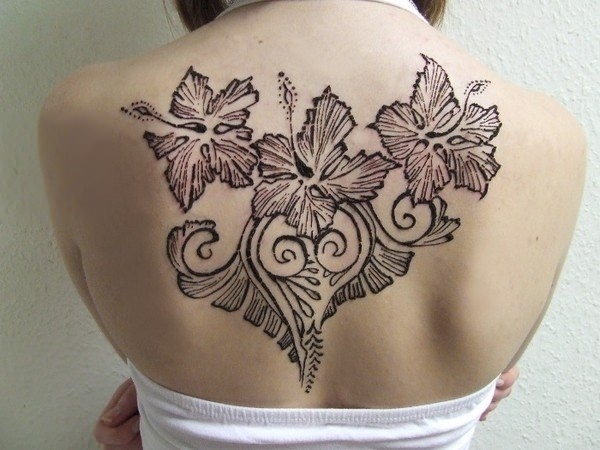 Another example of a floral henna design, this one is placed on the back. Dragons have always been popular tattoo choices for hundreds of years. 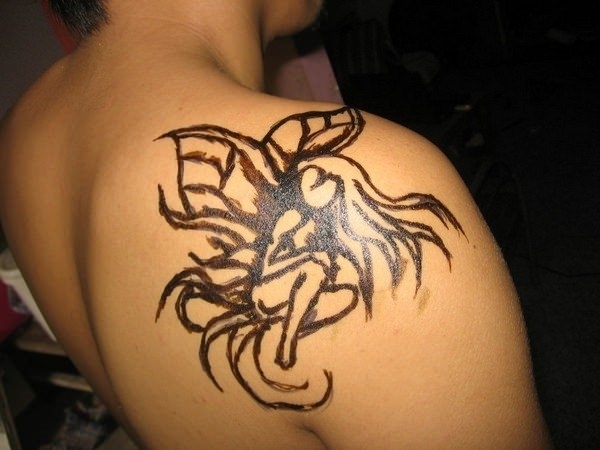 In this case, it’s a henna design. 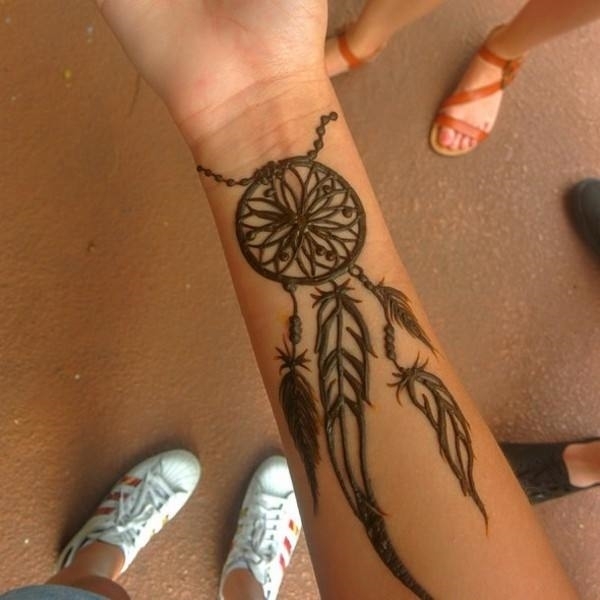 Dreamcatchers have always been symbolic of good fortune and wishing away bad fortune. It’s a great design that wraps around the wrist. 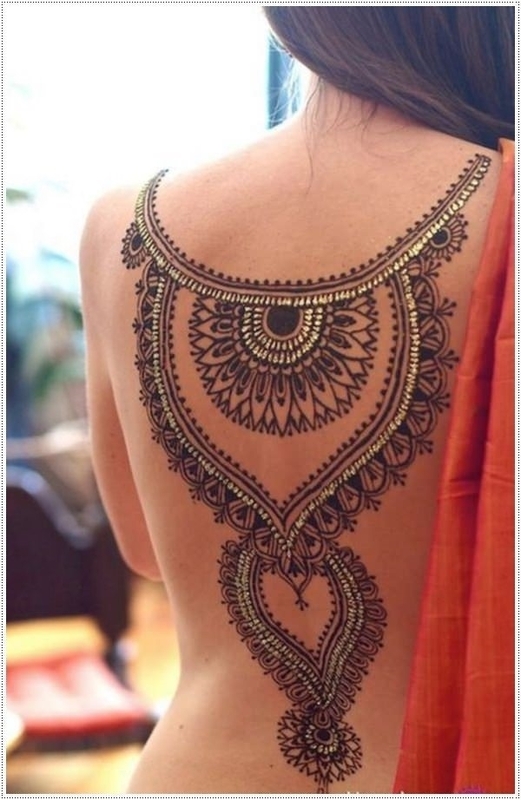 This henna design is stunning, and it sits on one shoulder. It’s a very intricate and delicate design, but it makes a big impact. Three peace symbols all different sizes. 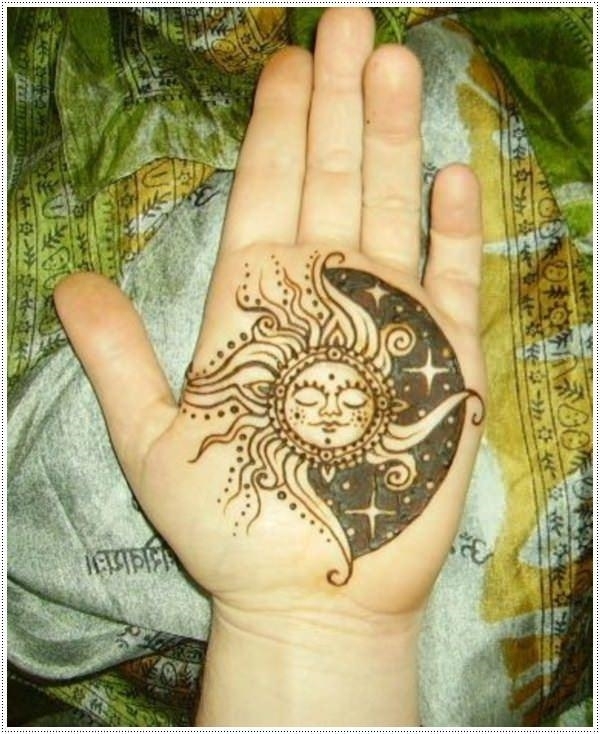 A unique and fun henna design. 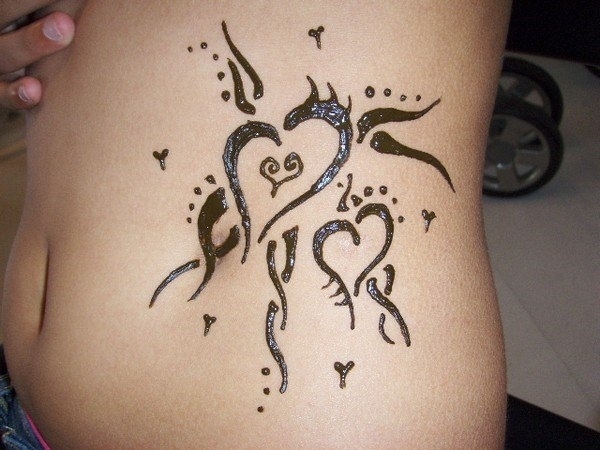 Henna tattoos are often given as a blessing to future fertility. 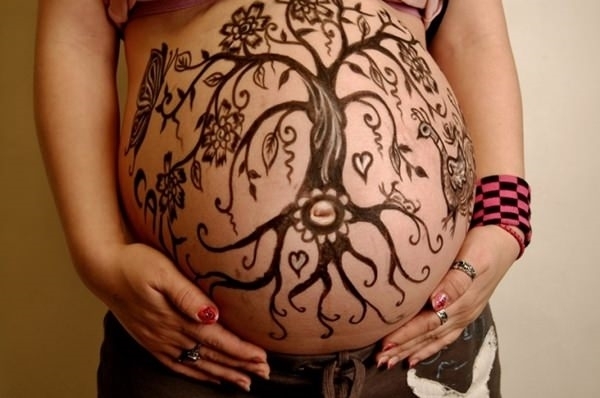 In this case, the woman has the tree of life tattoos on her pregnant belly. This is another example of a floral design, in this case, a rose. This design weaves across the hand in a beautiful flow. There are floral elements to the design as well. This sort of design looks like something that a royal would wear. Dark henna designs often mean a deeper love is involved. Both arms are designed with very dark ink. The designs here are made on the palm and the fingers creating a really unique look. 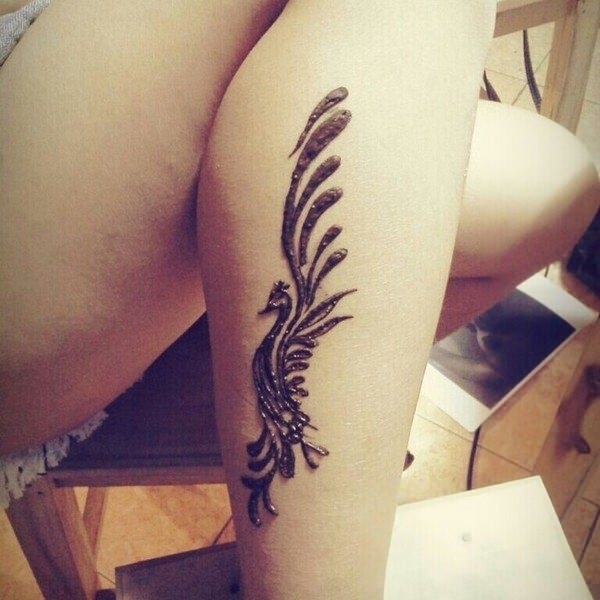 This henna design takes up her whole leg. 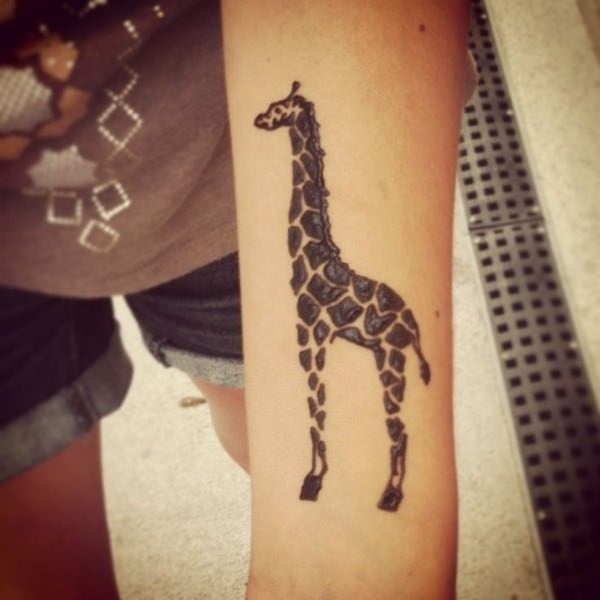 If you are looking for a large tattoo, then try this style out. This henna tattoo looks like a tribal design. It’s very intricate and makes a great tattoo. The designs are so detailed with this tattoo, and the colors are warm and inviting. I love the bronze coloring to the tattoo. 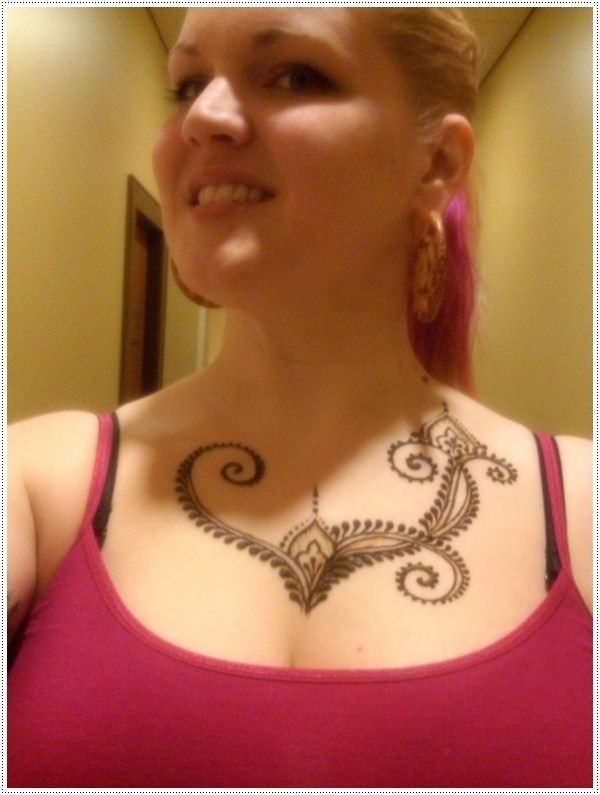 This chest tattoo looks great with a henna design. 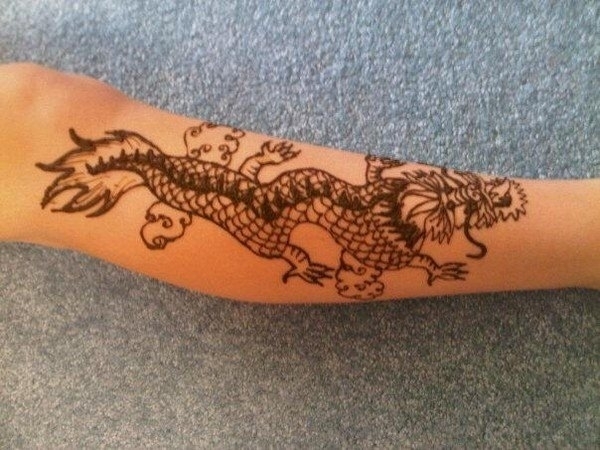 Try a henna sleeve tattoo and see if you want a more permanent look. There is so much detail to these designs that it’s breathtaking. Imagine such a beautiful design that has no permanent significance. The designs look like lacework, and I love how it goes right to the fingertips. 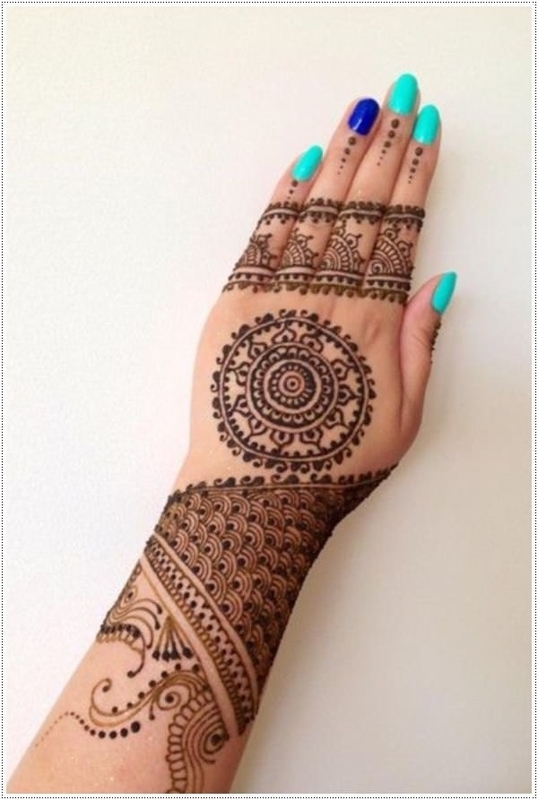 This henna design is stunning, and it looks like a piece of fashion. The sun and moon tattoos always hold certain significance to them. This is a great design for the palm. These little dots really make for a unique design. They really stand out against her skin. This design looks as if it could be a fancy sandal. It would be a great look to have for a beach wedding or even just a day on the beach. 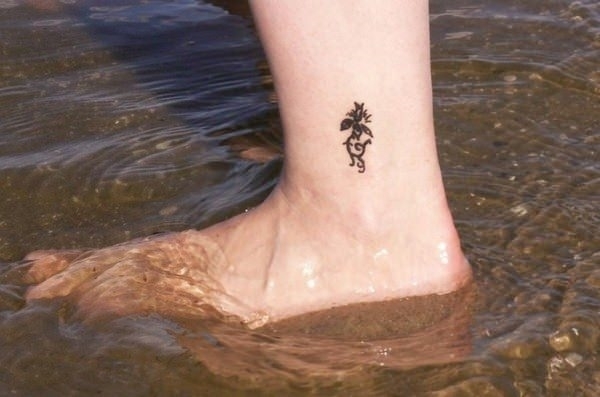 This is a great example of the kind of foot tattoos you can get. 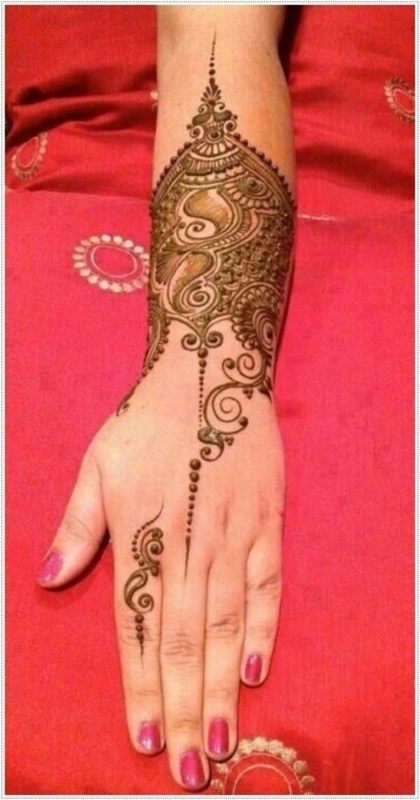 This design is large, and it has some spiraling designs along the hand. What a beautiful design that gets more detailed the further it goes down. This is a very large design that makes it look like you have a pair of boots on. This sun halved on either side and is joining to create a whole one. 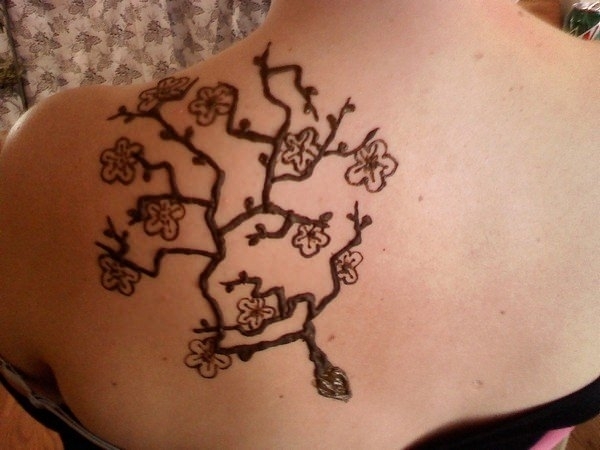 Apple blossoms are a popular design choice because they represent a new life. 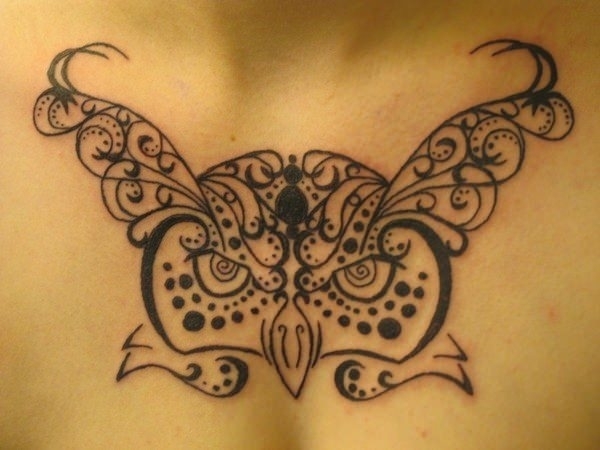 This owl tattoo is a unique example of how henna can be more than floral designs. The moon design is gorgeous, and it’s followed by a falling star. 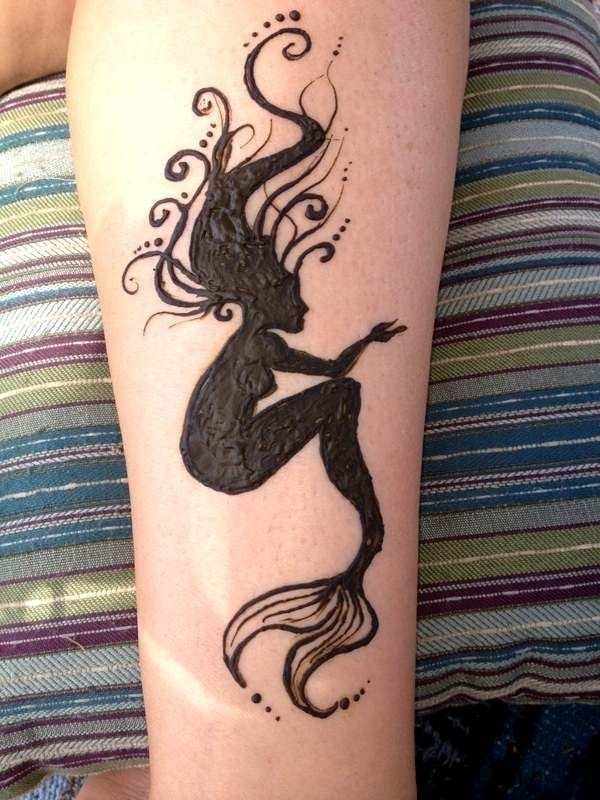 I love this henna tattoo of a mermaid. The silhouette really makes the whole look pop, and it’s also a fun design. 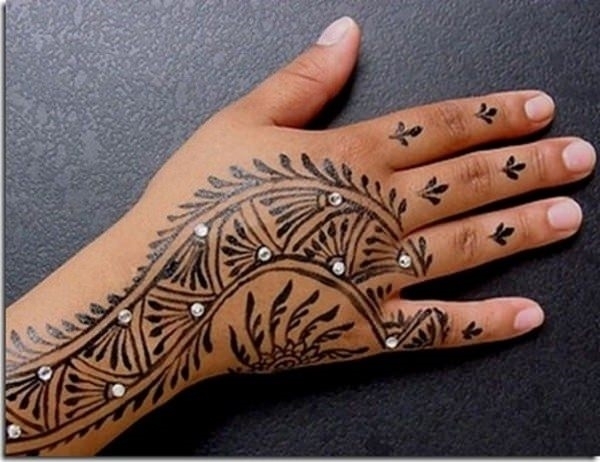 If you are looking for a different design, then this henna tattoo might be just what you are looking for. This is a sweet design for someone looking for a floral tattoo. 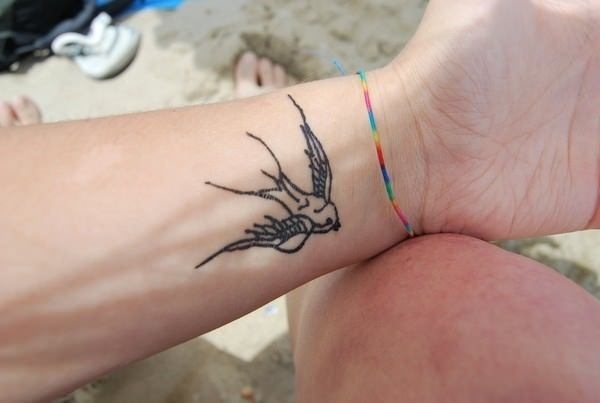 This is the smallest henna tattoo we’ve seen so far. If you want something simple, try this unique design. Here you can see how they are using the point of the cone to create the intricate designs. These designs are simple and don’t require a lot of work. 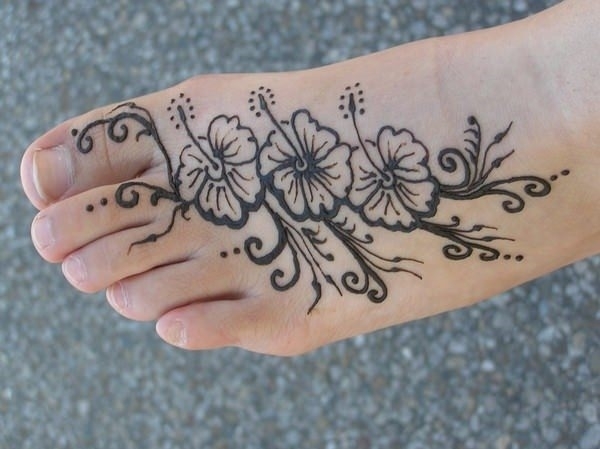 This floral design has three flowers and it’s a great design for the foot. 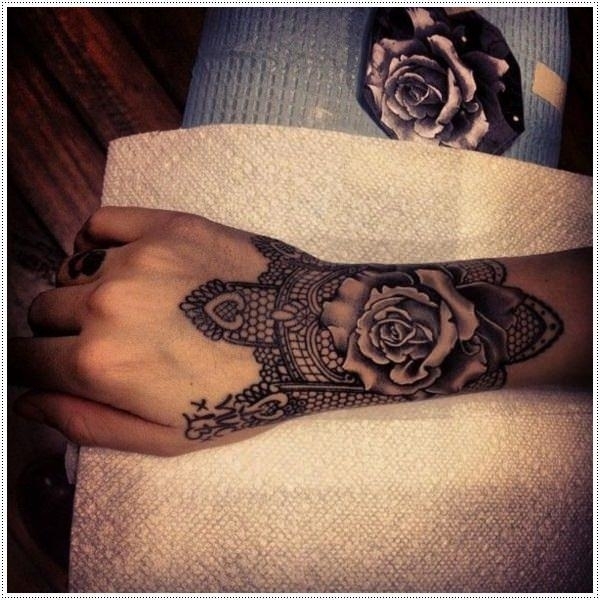 I really love the color choice with this henna tattoo, and the flowers just seem like a friendly tattoo. If you love turtles, then get one incorporated into your henna design. 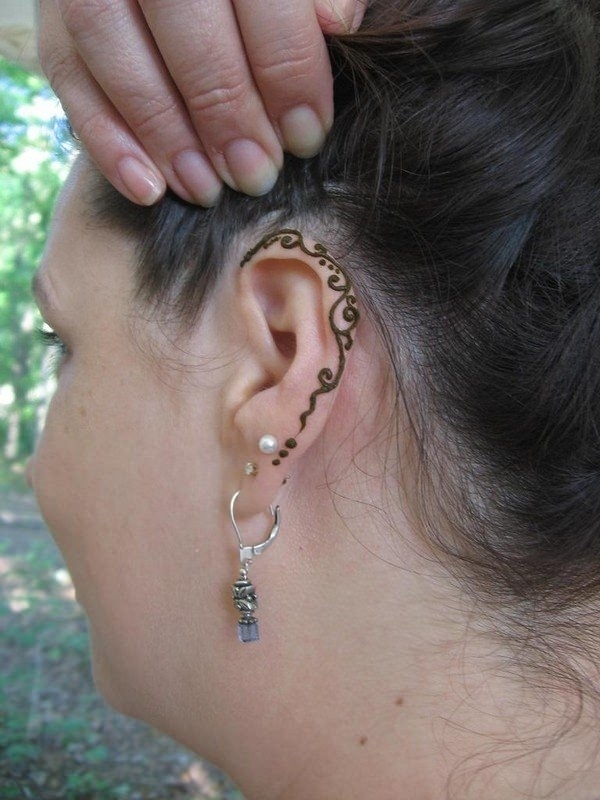 A simple design on the ear to create a unique look. These foot swirls make for an interesting design, and they go all the way down to the big toe. Another example of how beautiful bronze and gold look together. It’s a stunning design. 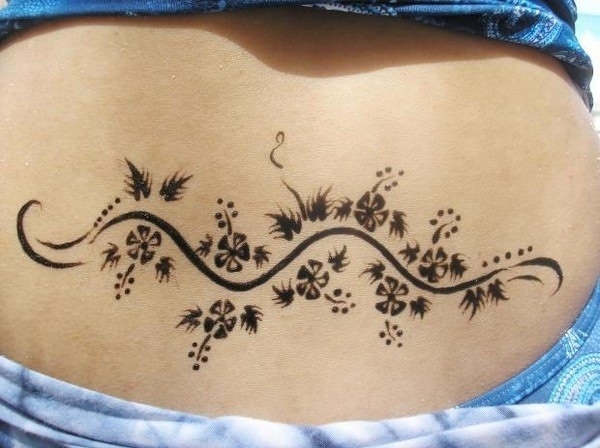 This back tattoo forms the shape of a woman, and it’s a simple yet beautiful design. These floating hearts make for a really cute design. 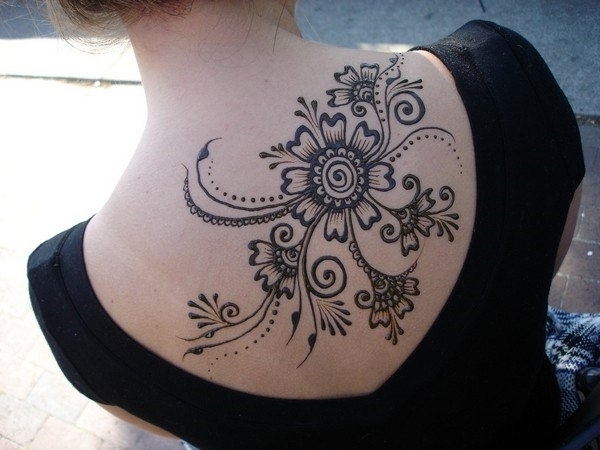 What a great henna design for the shoulder. You can have a henna angel watching over you. Another different design for someone who wants a unique look. I love how the spots are all individual. A very small design for someone looking for an uncomplicated tattoo. 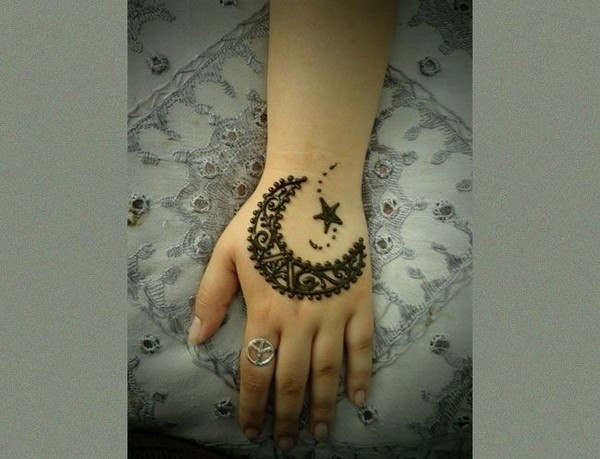 This henna tattoo sits on the wrist, and it’s one of the most elegant designs. 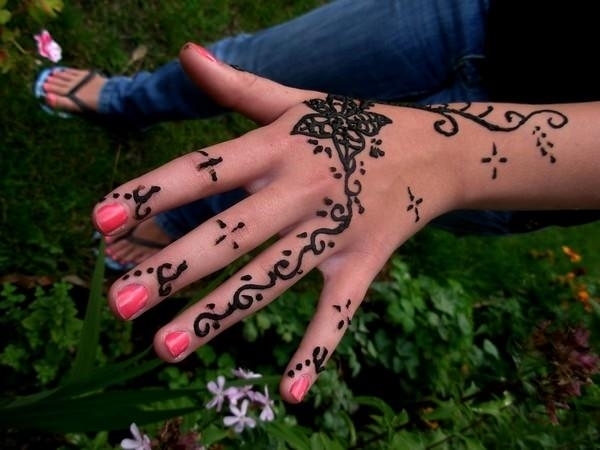 Henna designs can come in small or large sizes. This palm design goes well beyond the palm. 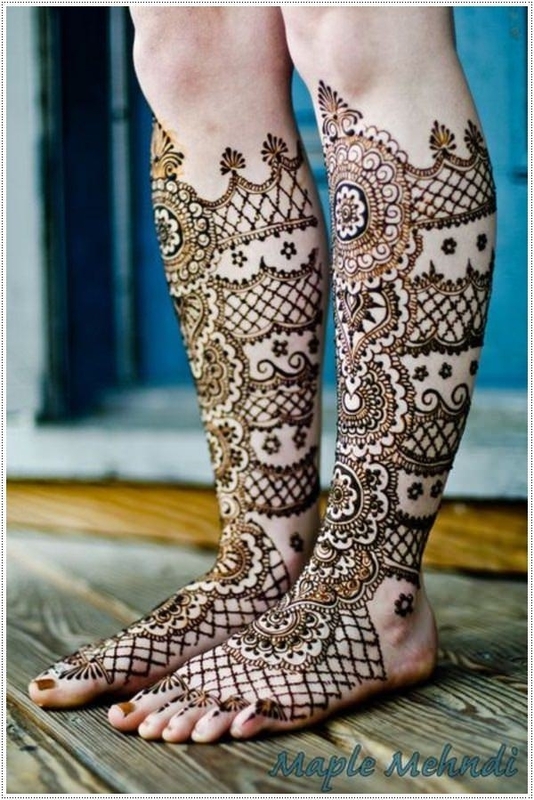 These lace designs really beautify the feet. You can tell that a lot of care and detail went into making this design. It’s one of my favorite because it’s so beautiful. 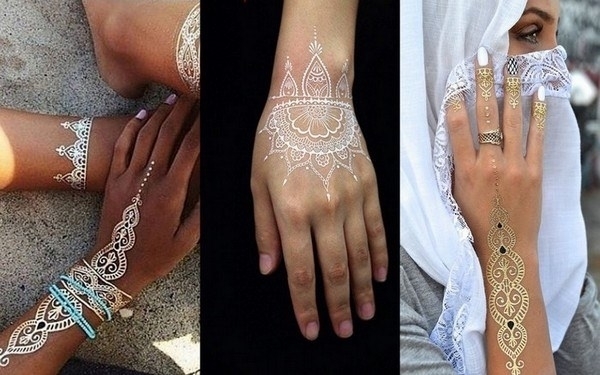 Henna tattoos don’t have to be one color. This is a great example of how one can look with a little sparkle. 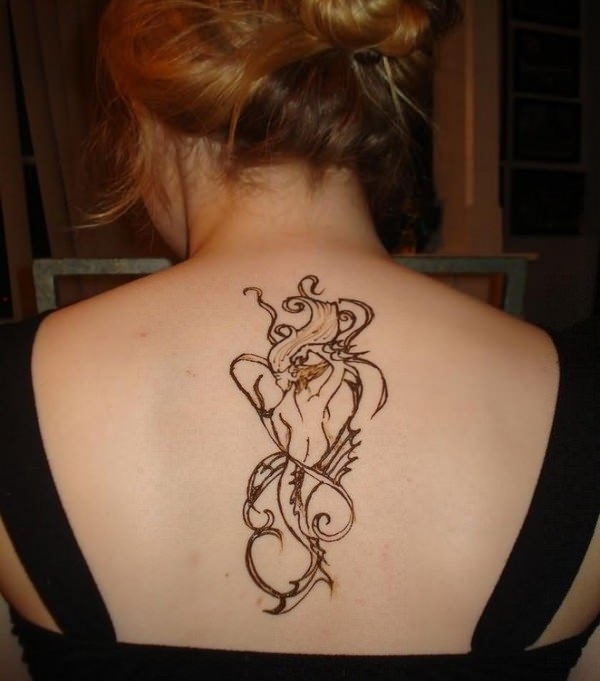 This is a really large henna tattoo, as it covers most of her back. The flowers are also a unique design. A simple design that probably didn’t take very long to create. 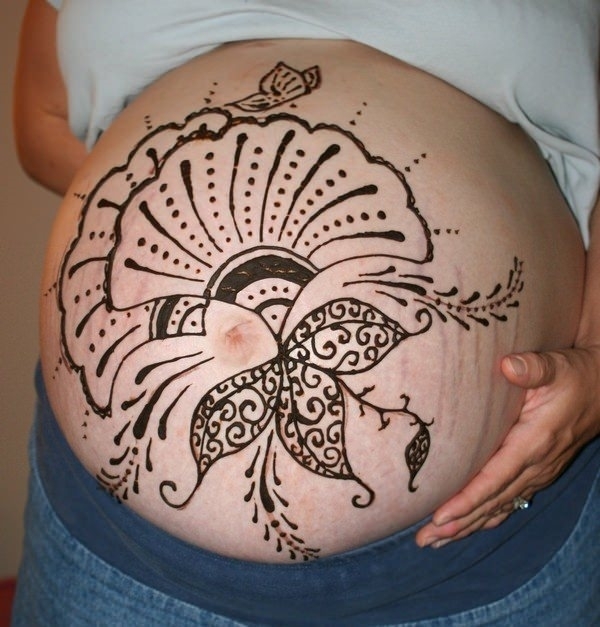 These great henna designs are fun for pregnant bellies. They bless the woman for fertility and good fortune while leaving her with a fun design as well. 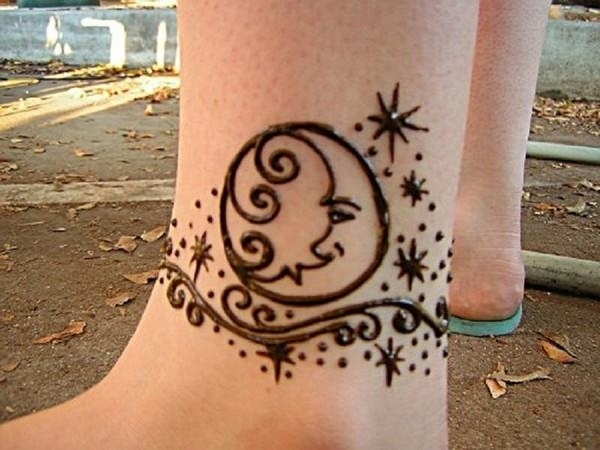 Another great example of the moon tattoos you can get with henna. 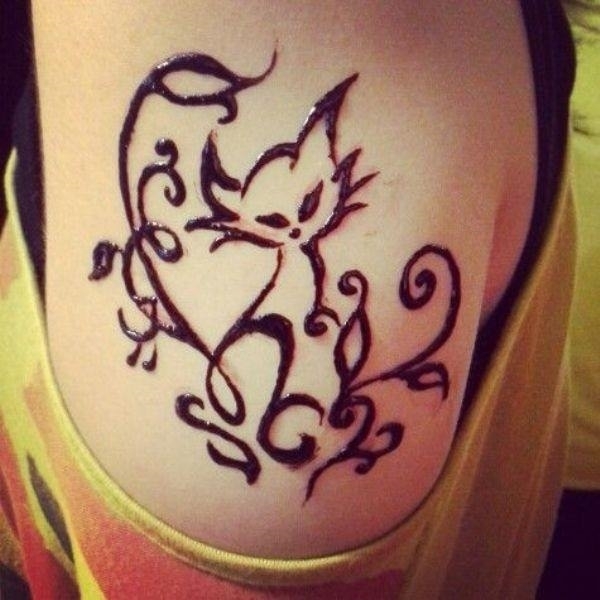 This is a cool kitty design that doesn’t have a lot of detail, but it’s still a great tattoo. The peacock is a great design that brings about love and great promise for the future. 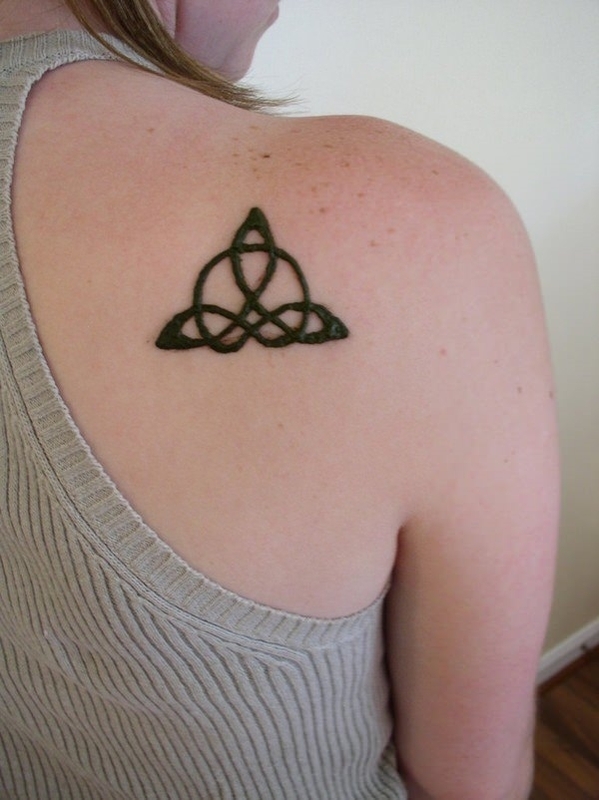 Many brides get this tattoo applied for their wedding as it’s symbolic. I love the design itself; it’s unique. Another great tattoo design, with a burst of florals. An amazing design for someone who is looking for some serious detail.